The North Table Mountain Ecological Reserve is a unique place where it is easy to find a wide variety of beautiful flowers. There isn’t a trail, you just wander over acres of countryside that can be covered with color. It’s out in the country and takes awhile to reach, but once you get there you’ll see vistas of flowers right as you step out of your car. If you time it right you can find several interesting waterfalls as well. This is an elevated basalt mesa, relatively flat and broad, with canyons cutting in on the edges. The ancient lava flows have created a harsh environment that many different wildflowers take advantage of. Vernal pools form because the rain can’t easily penetrate the hard surface. Note: Click on any photograph to see a larger image. This is a popular area when the flowers are blooming, so you won’t be by yourself on the weekends. It is such a wide open area, though, that this isn’t a problem at all. There aren’t any formal trails here. Pick an interesting direction and wander off, watching for flowers and streams. Take note of the large oak tree by the parking lot, so that you can find your way back. The Chico Hiking Association has an excellent map of the area (see the Phantom Falls Loop map) with GPS coordinates. On this map, at the middle right edge, you’ll see Cherokee Road and the “DFG Public Parking”. This is where you start. Everything is to the west of the parking lot. We found Ravine Falls and Phantom Falls to the northwest of our starting point, but we mostly wandered from place to place. You’ll find different kinds of flowers on the flatter east side than you will in the ravines to the west. Generally I would expect the best bloom to be in April, although that depends on rainfall. There is a range of flowers that show over the blooming season, but the farther away you get from rain the less you’ll see, as things can dry out quickly. You can find something interesting there from February through May. For this particular trip we went in mid April, and the weather was wonderful. It can be windy here, as most of the area is fairly exposed (the wind seems to be stronger in the afternoon). In other years, though, we’ve been there in mid April and found it to be too cold and windy to enjoy. The strength of the waterfalls depends on the timing of rain – water takes a couple of weeks to percolate through the basalt layer so even if the weather is dry when you go, the falls could be running. In this visit there had been a wet storm just a few days before we arrived, so the waterfalls were very active. This year we had a drier than normal winter, so some flowers weren’t as prevalent as you might find in other years. When we visited two years ago there was a wonderful display of Sky Lupine (I’ve included s shot of this below), but this year they were hard to find. The California Department of Fish and Wildlife offer tours on weekends, usually April and May (it varies each year). These tours are an excellent way to get introduced to the flowers and geography of the area. We enjoyed our tour very much! The guides explained the geography of the area, located California Newts in the stream, identified the flowers that are unique to the area, and led us to two of the falls. I don’t know that I would have found both of the falls on our own, and certainly not the Newt! Tours are limited to 25 people, and there are usually two tours a day (morning and afternoon). Signups are limited. Go to the North Table Mountain Ecological Reserve web page starting in early January to see when they start accepting reservations. The tours are at a reasonably casual pace, you’ll cover 2 to 3 miles. The terrain is somewhat rugged – you won’t be following a formal trail. Update Spring 2018: Due to the overcrowding at the trailhead on weekends, CDFW is no longer offering tours. Continue on Grand for one mile, turn left on Table Mountain Blvd. After just on-tenth of a mile turn right on Cherokee Road. Portions of this are narrow and windy. There are several branches off of the main road that aren’t clearly marked – stay on the main road. You may see signs for a “covered bridge”, that is the direction to take. During the blooming season there are portable toilets at the parking lot. Please feel free to help me by correcting any errors I may make. Click on any photograph to see a larger image. I’ll start with a few favorites, and then the “gallery”. 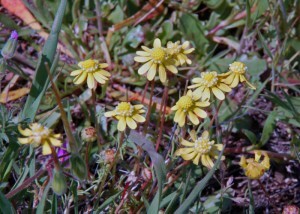 Yellow Carpet is often found in vernal pools (we’ve also seen them at Jepson Prairie. This, and Goldfields, are the golden color you see in landscape photos. GoldfieldsUsually you see large expanses of Sky Lupine mixed in with the Yellow Carpet and Gold Fields, but this year with the odd rain pattern we didn’t see a lot. This picture is from an earlier trip, in 2010. If the streams are running, in the deeper pools you can find California Newts. The Table Mountain Meadowfoam (also called Butte County Meadowfoam) is only found in this area. Sierra Mock Stonecrop was plentiful in the rugged broken lava fields near the road. There were two kinds of poppy – Frying Pans are low and don’t have leaves on the stems, Foothill (or Tufted) Poppy tend to be taller. This entry was posted in California Wildflowers and tagged Butte County, Northern California, Vernal Pools, Waterfalls. Thank you for this post. Nice photos and insight. I will be in the area tomorrow and hope to get in there for some exercise and a few shots. Lovely photos and information. Thank you! Please note that a current fishing or hunting license, or Lands Pass @$4 per day and change, is now required for anyone over the age of 16. For more details on the wildflowers, including charts of growing seasons, see the book The Wildflowers of Table Mountain. And for directions to several of the waterfalls, you might want a copy of our book, The Flumes and Trails of Paradise. Happy Trails!